Welcome to Driver Education, one of California’s most effective online driver programs. 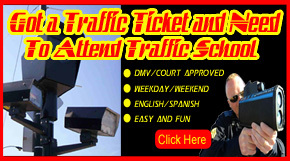 We offer DMV sample permit tests as well as the DMV video test so you can study and look over the questions as many times as you like. When you are finished with our course we will send you your completion certificate. Our website is very easy to use. When you register, you can choose your own password and username to gain access to the course. Our years of experience allows us to offer quality online driver education for teens. This course was created to be as convenient and as interesting as possible. Our online program was designed to include interactive games and videos to keep you learning while actually enjoying your time on our site. mandatory 75% to move on to the next chapter. When you pass the quiz, you will be able to save your score. If you missed too many questions, you will be able to go back and read over the material and retake the quiz. The computer will grade the tests and you will know immediately if you have passed. We believe the best way to learn is in a controlled and safe environment that is free of distractions with an experienced instructor available to answer any questions. Our program is very interactive and will involve every student. The course is based on the five fundamentals of driving: Common Sense, Courtesy, Patience, Caution and Awareness. "We won't just prepare the student to pass the written test, we will teach the necessary skills to stay safe." Please call our office directly for more information, or to register for classroom driver education. Seating is limited, as we like to keep our classes small for a much more focussed and beneficial learning experience. Students registering for the bundle package of driver training with either online driver education or classroom driver education should call our office to make sure your zip code qualifies for free pick up and drop off. Our pricing specials are only for minors. Adults please call our office for rates. Freeway Driving & Traffic School requires that cancellation of a scheduled appointment be made 24 hours before the scheduled date and time. For cancellations that are less than 24 hours there will be a $20.00 fee added that must be paid before the next lesson. We have a very strict no refund policy-NO EXCEPTIONS! Promotional package pricing for driver education and driver training is good for up to 1 year from date of registration or 18th birthday, which ever comes first. Students who do not complete the program within this time frame, here by forfeit any balance and remaining hours. We reserve the right to cancel and re-schedule an appointment at any time without prior notice, classroom driver education may be canceled at anytime for any reason, or unforeseen event due to last minute emergencies, illness, traffic, weather conditions and vehicle malfunctions. Students that take our online driver education course will receive a $50.00 discount towards our behind-the-wheel 6 hour promotional package of $270.00. Discount is applied instantly, therefore you will only pay $220.00.